This dish started out Korean, then ended up Chinese. I wanted to make Korean Braised Potatoes, so I set about doing so. 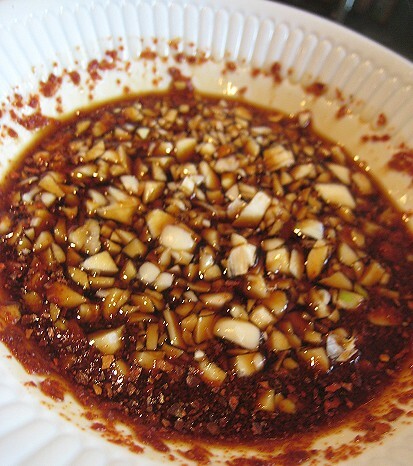 Here's a mix of soy sauce, sugar, a touch of vinegar, and some coarse Korean chili flakes (gochugaru). The recipe I used called for maltose. Whoa, look at that! It was so thick and stiff! 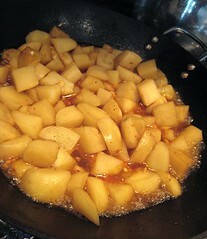 The potatoes went into the wok, I added the soy sauce-based liquid, and braised the potatoes. When they were halfway cooked, I added the maltose diluted with a little bit of water. The hope here was to have the sauce thicken and act as a glaze for the potatoes. Unfortunately, I had to leave the house at this juncture, so I turned the heat to "sim" and hoped for the best. When I returned, the potatoes were already mushy, but the sauce hadn't become glazy at all! 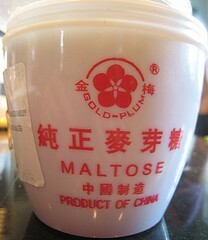 It was bizarre, given, how thick that maltose was. 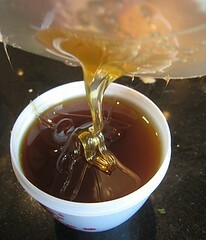 You would've thought the liquid would have no trouble thickening up. The potatoes tasted perfectly fine, but it wasn't what I was hoping for. I had to think of plan B. We happened to have garlic chives in the refrigerator, so I thought, why not make garlic chive pancakes (like we did before)? 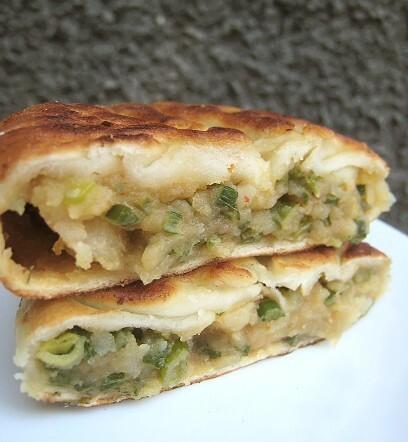 But, to use up these mushy potatoes, I decided to make a "cake" stuffed with a mixture of potato and garlic chives. 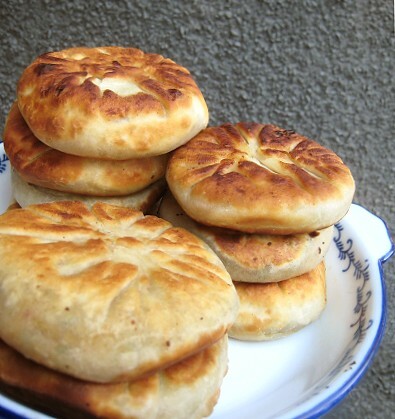 I don't know what to call this in English; all I know is that this is still a type of "bing" (餅), a term that encompasses a whole range of food items, provided they are some sort of disc shape. 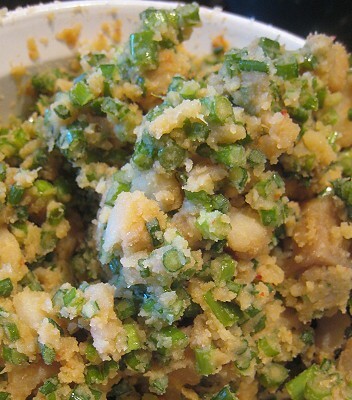 I mashed the potatoes, added chopped garlic chives and proceeded to work on the hot water dough. This hot water dough is truly genius. So easy and so fast! Yes, it really is just hot water and flour. Add enough water to the flour until you form a dough. 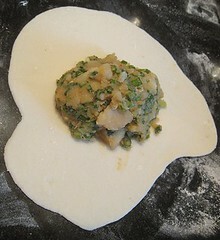 I rolled out a roughly round shape (operative word is "roughly", as you can see), placed the potato-chive mixture in the middle, wrapped it up, then flatted the cake into a fat disc. These fat discs are so adorable! They were simply pan-fried, then good snacking was had by all. Add enough water to the flour to form a dough. Knead a few times, and it's ready. 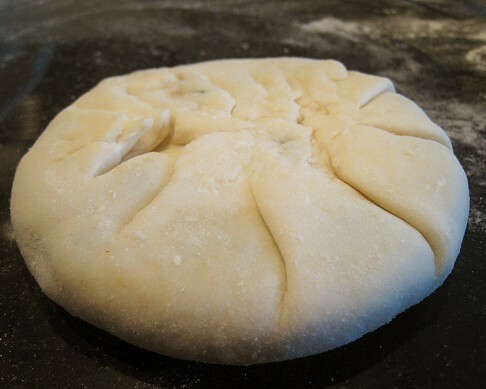 Roll out small circles of dough, fill with any filling, pinch together the edges and press gently to form a disc. 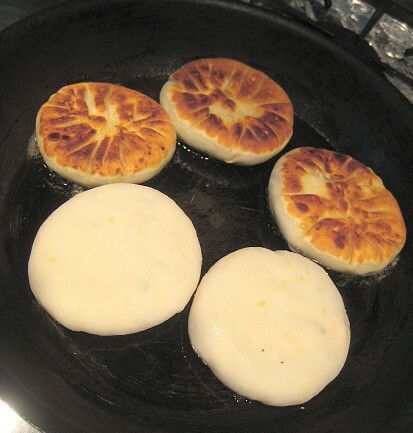 Pan-fry each side in oil over medium heat until dough is cooked. Since these didn't turn out as I had hoped, I'm not including the recipe. But, in general, should you wish similarly-flavored potatoes (to eat by themselves, or as a filling for Chinese pancakes, or for any other purpose), these are the ingredients. Adjust each ingredient according to your taste. 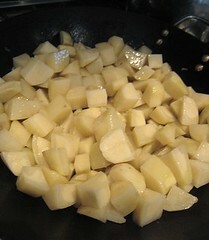 Add potatoes and mixture above to a pan. Boil liquid then turn heat to low. Add this to the cooking potatoes when the potatoes are about halfway done. Let simmer until the potatoes are tender and the liquid has reduced. Season to taste. ooh, I really like this idea! I've worked with the hot dough before, and it's great. LOL the dish started out Korean and ended up Chinese! 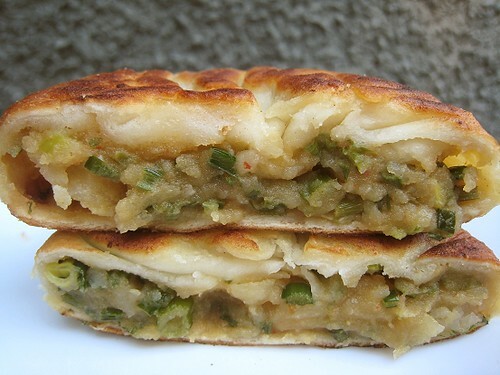 It looks really good, stuffed pancakes have to be good in any country! Great job!!! I have not thought this is possible to make at home! I have to try it one day. Gotta bookmark this. how this is what we call fusion! That is one tasty looking snack! This actually looks pretty good for a "mistake"! 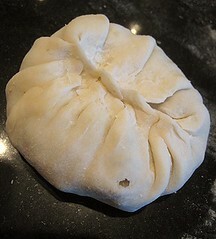 Looks great, almost like Sheng Jian Bao. Thank you for sharing such a nice recipe. I would love this item. I am giving a party to my friends this weekend at my farmhouse. I was wondering about some new item to treat my friends with. I will surely try this and let you know. Yeah, it was so easy, that dough! Thanks for the tip! I'll have to check them out. We'd love to see your version! A happy accident, it turned out to be. We hope it all turned out OK! Your post is making me super hungry. That looks really good! This is great! I like how you adapted the potatoes to the other recipe. And yes, hot water dough is awesome.